If you have not heard Apple is removing the original YouTube app that has been on iOS for many years. The app has pretty much been unchanged since release and in Apple's effort to remove Google Apps from the iOS ecosystem Google has responded with its own updated version of the app. It is great that this app was released the day before the iPhone 5 announcement as well as a possible release of iOS 6. Once you install iOS the stock YouTube app will be removed as well as Google Maps and it will replaced by Apple's new Maps application. The app now takes on a much newer look and feel that was also recently introduced in the Android app. 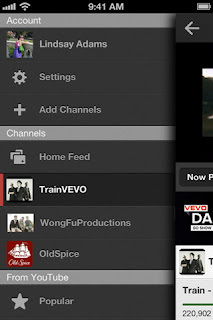 You can easily open of the left sidebar to view your playlists or view videos for specific channels you are subscribed to. For many users it is going to be hard for them to see the introduction of ads into the app but it is vital for YouTube to add this to give support to people such as me to continue to making great content. You can find that app here and make sure you install it now before the old version disappears in a few weeks. The iPad version is currently in development and will be released in the coming weeks. Let me know what you think of the new app.